Not a lot of commentary is even needed on this one. Copenhagen was like my “mecca” before and they refuse to do anything except make it more impossible for me not to want to move there. Copenhagenize.com – Building Better Bicycle Cultures: Innovative Elevated Cycle Track in Copenhagen. Unique locations require unique solutions, whatever the city. Construction starts in February on a fantastic and innovative solution to fix an important missing link in the Copenhagen bicycle infrastructure network – Bryggerampen. Bryggebroen – bicycle and pedestrian bridge over Copenhagen Harbour. In 2006, a bicycle and pedestrian bridge – Bryggebroen – was opened across the harbour in Copenhagen, connecting the Vesterbro neighbourhood with Islands Brygge on the other side. It was the first fixed link over Copenhagen harbour for a few centuries. It was an immediate success. Bicycle users from not only Vesterbro but the rest of Copenhagen were given a faster connection to the island of Amager. 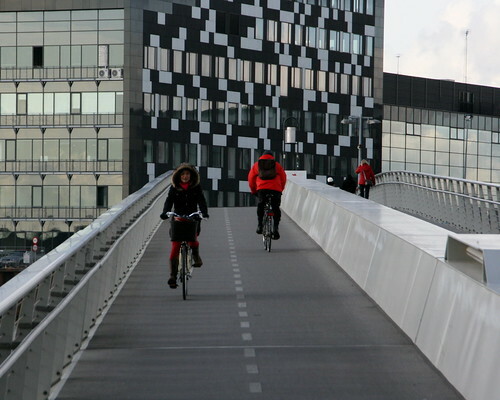 Easy access not only to Islands Brygge but also to the universities, Danish Broadcasting and the whole new urban development of Ørestad – as well as bicycle users commuting in the opposite direction. There are currently 9000 bicycle users crossing the bridge each day. That number is estimated to be almost double if it weren’t for an irritating missing link on the north side of the harbour. Two options are currently available. You can walk your bicycle down the stairs, using the ramp, to get to the harbourside and on to the bridge or you can cycle a detour around the Fisketorvet shopping centre. Both are a pain. Especially for cargo bike users. This entry was posted in Bike commute, Car Free, Urban Bike and tagged Bike-Friendly, Car-free movement, CarFreeBrad.com, Commuting, Copenhagen, Copenhagen Bike Bridge. Bookmark the permalink.